“12 water protectors arrested stopping Spectra’s pipeline pull across the Hudson tonight. Spectra commenced destruction after the 12 were taken and now is currently hammering IN the pipeline (as opposed to pulling it through) according to video of a neighbor in Verplanck which we think sounds like they are having problems. Please pray their problems continue. The 12 are now being transferred to an arraignment and the District Attorney is asking for $50,000 bail for each person. We will keep you posted after this special nighttime arraignment, which is going to be the same judge that just found the Montrose9 guilty. Please, if you are in the area, meet us at the courthouse at 1 Heady St in Cortlandt Manor, NY. If you are not, please keep us in your hearts. Our attorney David Dorfman is meeting us at the courthouse. He is amazing. The twelve people arrested at the Verplanck, NY Spectra construction site were arraigned overnight in Cortlandt, NY. The District Attorney asked for $50,000 bail each. Dave Dorfman, our attorney, met with Judge McCarthy in the wee hours, and got the judge to reduce bail from $50,000 to $5,000 for 11 of them and $1,500 for one of them. They have been sent to Valhalla Correctional Facility at 10 Woods Rd. in Valhalla, NY. The individual with bail reduced to $1,500 is a New York resident, while the other 11 are from out of state. All have prior experience protesting fossil fuel infrastructure, according to Fraczek. To assist with $500 bond for the eleven out-of-state arrestees, you can donate to Mississippi Stand. To assist with $150 bond for the New York resident, you can donate to ResistSpectra. 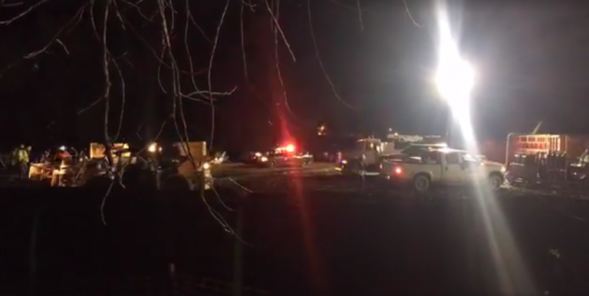 Twelve people were arrested at a construction site in Verplanck, NY where Spectra Energy is “pulling pipe” under the Hudson River to complete its AIM pipeline project. The twelve “stormed inside” the site, according to Kim Fraczek, director of Sane Energy Project. Six of the activists then locked themselves to construction equipment, disrupting nighttime work on the pipeline. Supporters off the property cheered as police pulled out with the twelve arrestees. Six activists have locked themselves to equipment at a Spectra construction site where the Algonquin Incremental Market (AIM) pipeline project crosses the Hudson River. At about 8:30pm, activists swarmed the site where Spectra is now pulling pipeline under the river, according to Kim Fraczek of Sane Energy Project. Spectra security, state police and local police officers are on the scene. Objections to the Spectra AIM gas pipeline have largely focused on its route, which passes only 105 feet from the Indian Point Energy Center. The river crossing in Verplanck, NY which the activists have locked down is less than a mile from the nuclear power plant. The aging nuclear power plant has a long history of emergency shutdowns and leakage into the Hudson River. People opposing the project contend that with the additional of a 42″ diameter gas pipeline, an accident is likely and would have catastrophic consequences. Spectra AIM was supposed to go into service on November 1, transporting fracked gas from Pennsylvania to New England, but there were difficulties with test drilling under the Hudson River over the summer caused delays. Clay in the river bed collapsed during test drilling, and a drill bit broke and was lost in the river. The drill method is the controversial Horizontal Directional Drill (HDD) technique. Over project opponents objections, the Federal Energy Regulatory Commission gave permission for the company to continue with the project. In October, construction was also delayed when four activists crawled into pipeline intended to be pulled under the Hudson River and occupied it for 16 hours.